Coptic Orthodox Church in Cairo, Egypt, Sunday. CAIRO—Tens of thousands of Coptic Christians lined up outside a cathedral in the Egyptian capital on Sunday to pay their final respects to the spiritual leader of their ancient church, whose body was seated inside on an ornate throne. 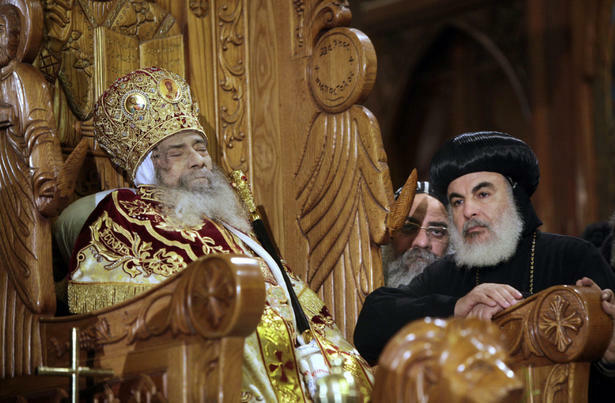 The grief of the faithful filing past Pope Shenouda, who died Saturday at 88, may also reflect the uncertainty felt by the country’s Christian minority following the recent rise of Islamists to power. In his death, Egypt’s 10 million Christians have lost a seasoned protector at a bad time. “He has been our protector since the day I was born,” said a tearful Antonios Lateef as he waited in line to take one last look at the Pope, who spent 40 years at the helm of the Coptic Orthodox Church. Amid the throngs, three mourners died of suffocation inside Cairo’s main Abbasiya cathedral, where Shenouda’s body will be on display until his burial Tuesday. Shenouda, seated on the throne of St. Mark, or Mar Morkos, was clad in the elaborate regalia he traditionally wore to oversee services and held a sceptre. Soldiers backed by armoured personnel carriers deployed outside the cathedral, possibly as a deterrent to attacks by militant Muslims. It could take months before a successor to Shenouda is found, according to Fuad Girgis, a member of the Church’s local layman council, known as el-Maglis el-Melly. “Pope Shenouda assumed the throne of St. Mark eight months after the death of his predecessor,” he noted. During his 40 years as patriarch, Shenouda strove to ensure his place among the main players in this mainly Muslim nation, pressing demands behind the scenes while keeping Christians’ anger over violence and discrimination in check. Christians’ worries have deepened recently with the rise of Islamic movements to political power in parliamentary elections.